Google Home Hub gives you the power of Google and help at a glance thanks to a 7 touch screen display. Keeps you informed and up to date with visuals: Instant news, weather, & commute updates without lifting a finger. Start your smart home: Always improving with seamless connections to the latest compatible smart lights and thermostats. Touch screen Sometimes it's easier to see the answer. Google Home Hub has a 7 touch screen display so you can see everything in one view, whether it's your appointments, shopping list or reminders, and you can easily view video content. With Ambient EQ, it dims screen brightness to match the lighting in your room. And of course, like all Google Home products, you can still use your voice to get things done too. Set up personalised routines You can set up Voice Match, and just say “Hey Google, good morning” to see your personalised events, commute, reminders, and more. Or opt to always keep your latest events and reminders displayed. You can set up custom routines with compatible smart devices too. For example, just say “Hey Google, good night” to set an alarm, turn off the lights, and much more. * Control your connected home in one view Voice-control compatible devices, from lights and cameras to TVs and more. * Seeing and controlling them all in a single view means no more switching between apps. It's compatible with hundreds of smart devices, including thermostats, video doorbells and security cameras. Get answers Just ask the Google Assistant and get rich, visual answers about recipes, local businesses, sports, and more. Some questions are better answered with a video. Just say “Hey Google, show me how to cut a pineapple” to see how. Crystal-clear speaker Enjoy songs and videos from YouTube Music on a richly detailed full-range speaker. Plus, listen to music services like Spotify and Deezer, and many radio stations from TuneIn. ** View Google Photos Use your voice to show any of your pictures in Google Photos. You can see your favourite albums on its display too. Control by voice or touch Two far-field microphones detect your voice from across the room, so you can control your Google Home Hub while you're doing other things, or streaming music. Alternatively, its touch-sensitive screen puts control at your fingertips. Google Home app Download the free Google Home app (available on iOS and Android) onto your smart device for easy set-up and control. Please note this app is required to operate Google Home Hub. 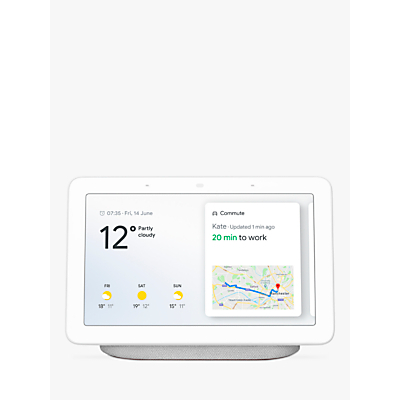 Google Home Hub is compatible with Nest, Philips Hue, Hive, Samsung SmartThings, IFTTT, TP-Link, Spotify, Google Play, TuneIn, Youtube, Netflix, Google Photos, Google Chromecast, Philips, Sony and more. ** System requirements: Wi-Fi network Mobile device running Android 5.0 and higher or iOS 10 and higher * Compatible smart device required. Subscription(s) are required to access certain content. ** Google Home Hub is optimised for selected compatible music and video services only. Additional terms, conditions and/or subscriptions/charges may apply. Even if you're using Multi-user and Google Home Hub is meant to recognise your voice, keep in mind that a voice similar to yours, or a recording of your voice, could result in Google incorrectly recognising someone else as you. A Smart Speaker is a platform that can run 3rd party Apps. 3rd party content providers may remove Apps from the Smart platform or stop supporting them at any time, and we cannot guarantee an App's availability. When new Smart products are launched, there may also be a delay before certain Apps become available. Availability of Apps is not included within the terms of the manufacturer's warranty, or the John Lewis 2-year Guarantee for audio visual products, or the 5-year Guarantee for TVs.